It's Not Work, It's Gardening! : It's (sort of) working! Technically, the pond netting I installed for the first time this year is working. 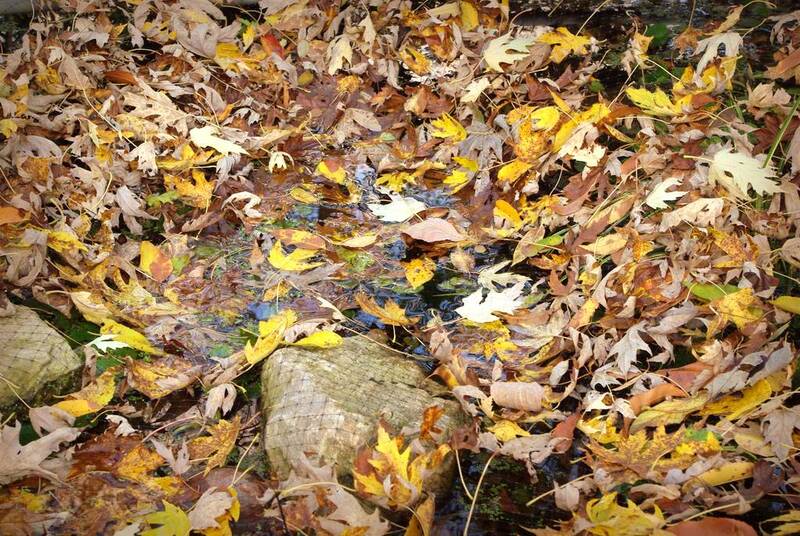 It's catching the leaves and keeping them from sinking under the water. Unfortunately, it's not keeping all of them from touching the water. This is partially due to the unplanned disconnecting of the two parts of the one support, but mainly due to rainfall making the leaves that were caught extra heavy. This means that these soaking leaves will still probably contribute some tannin to the water, making it brown and tea-like for a while. I'm not overly concerned about this, as there were way more leaves in the water for a much longer time last year, and everything turned out fine. I'm actually glad I did almost nothing to keep organic matter out of the water last winter except for adding the beneficial bacteria (winter blend for cold water). 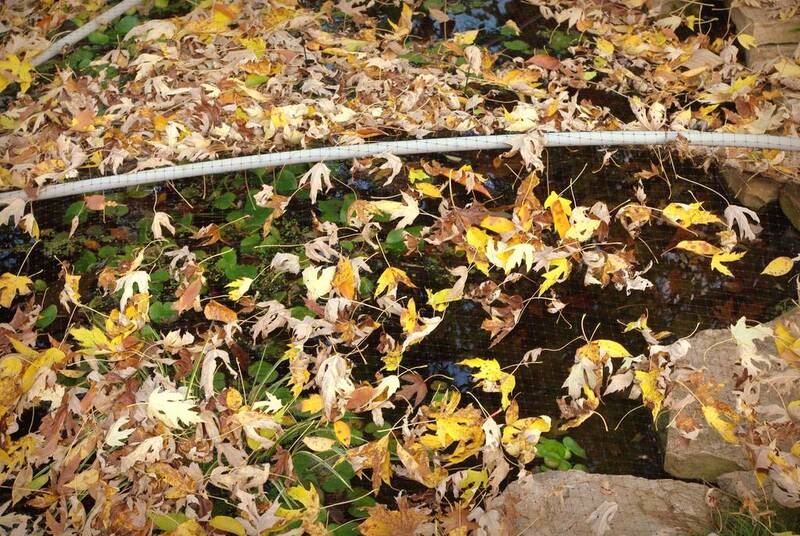 If I hadn't done that, I would probably think that every single leaf that falls in would be killing a fish. I'm going to borrow my neighbor's leaf-vac to remove these. If it doesn't work, I may have to peel back the entire net -- but I don't want to do that yet, as there are still quite a few leaves that haven't fallen. Of course I'll let you know how it goes. Glad it's working out...having a pond is always so much more work than I think it is! Read my comment on your first post - this is what I imagined happening if I netted. 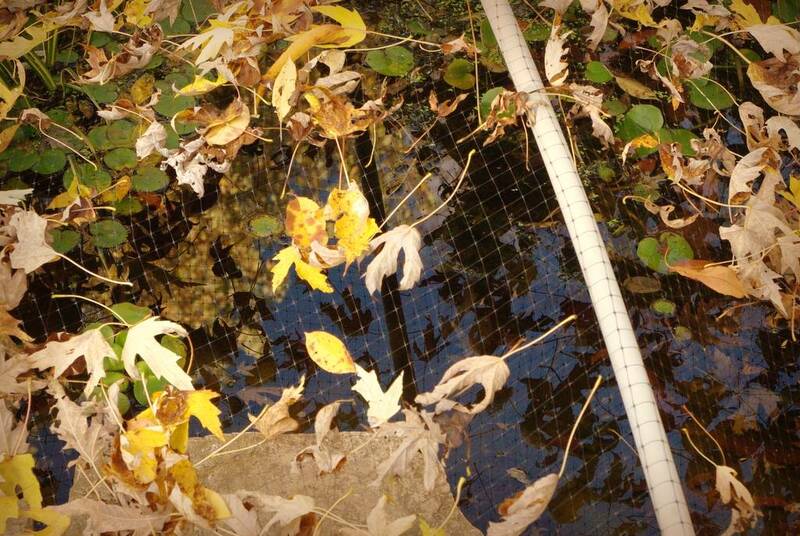 You have way more leaves than we do, so it's definitely worth netting, though. But a few leaves are a good thing - tadpoles and crayfish love them in the spring, or so I've heard! As for a pond being work, I tell people this - there are lots of pond related tasks, but, like gardening, if you enjoy it, it's nothing but fun! The best moment of my day is getting home and wandering out to the pond to see what's new. I end up puttering and poking around and, in the process, leave the work day behind. I'd like to have a net over my entire deck. Lisa: I agree that it is *so* worth it. 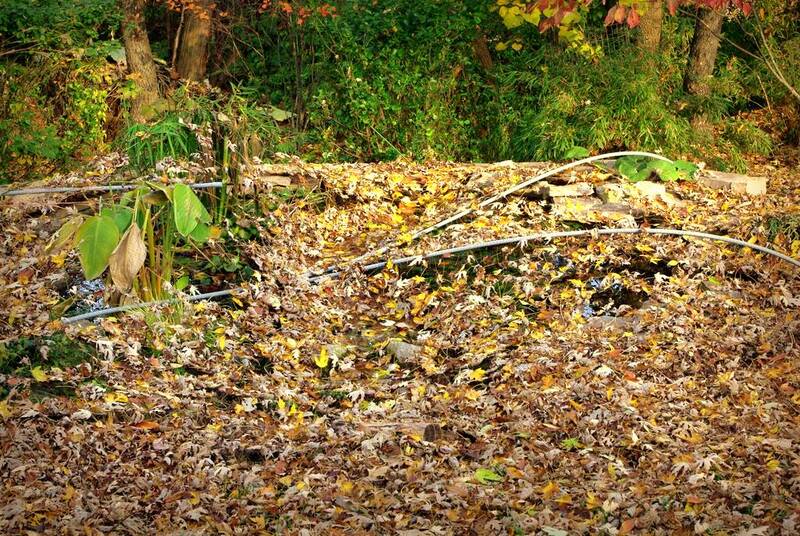 I can't imagine my garden without the pond. We have the same challenge with our (much smaller) pond. My husband created a wood-frame net that sits on the top during the autumn. And in winter, he covers our little pond (above ground-different than yours) with a lexan cover, with plenty of ventilation on the sides. He also inserts a small heater in the pond. But, again, it's a different kind of pond than yours. I really like the look of yours. Our goldfish survived the winter last year--I hope they will this year, too. We are faithful with the bacteria as well. Some pond people claim it's snake oil. I take it on a mix of faith and science.